Jack is a native Montanan, born on Blue Water Creek just outside of the community of Fromberg. He graduated from Bridger H.S. and joined the U.S. Army, completing basic and advance basic training in Fort Ord, CA. Jack was honorably discharged after three years of active service and spent a few years in North Carolina where he received an AA degree from Sandhills Community College. 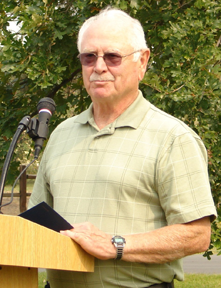 He received a BS in Forestry from the University of Montana in 1971 and began his career with Montana DSL on the Southwestern Land Office in 1972. Jack spent his entire career working for DSL/DNRC out of the Missoula offices. For 25 years, he served as the state wildland fire coordinator. Jack was also a Logistics Chief on an Incident Management Team. He was instrumental in developing and maintaining agreements between state, federal and international partners in the fire management arena. Jack retired from the DNRC at the end of 2001.